It’s been a big day for BMW’s competitors and their supercars. First it was Mercedes-AMG with its Project One and now it’s Audi. Ever since former Audi Sport Boss, Stephan Winkelmann, teased the idea of a rear-wheel drive Audi Sport model, fans have been toying with the idea in their minds. “Would a rear-wheel drive Audi defeat the entire purpose of an Audi?” Admittedly, rear-wheel drive is the best way to get a pure, connected driving experience, the sort that enthusiasts love. However, it’s just not normally the Audi way. Audis are about Quattro all-wheel drive and tenacious grip. In theory, a rear-wheel drive car is more fun than an all-wheel drive car. But all-wheel traction has been ingrained in Audi’s brand heritage for so long, it seems odd to have one without it. So will a rear-wheel drive Audi really make any sense in practice? We’ll find out with the newly debuted Audi R8 V10 RWS (Rear-Wheel Series). The Audi R8 V10 RWS is a rear-wheel drive variant of the standard R8 V10 and it will come in both Coupe and Spyder variants. So that means it makes 540 hp from its 5.2 liter naturally-aspirated V10, unlike the 610 hp V10 Plus Quattro variant. The reason for using the lesser engine is likely due to power restrictions for just two driven wheels. For just rear-wheel drive, 610 hp is a bit much. Still, though, the RWS can get from 0-60 mph in just 3.7 seconds for the Coupe and 3.8 seconds for the Spyder. That’s not as quick as the all-wheel drive variants but it’s more than fast enough to be epic fun. Especially considering that the RWS can do smoky burnouts, donuts and powerslides. It gets even better, though. Thanks to the lack of a driveshaft, axles, multi-plate clutch and center differential to help power the front wheels, the Audi R8 V10 RWS is a decent bit lighter than the standard all-wheel drive variant. Audi claims its 50 kilograms (110.2 lb) lighter than the standard car and 40 kilograms (88.2 lb) lighter for the Spyder variant. That makes them 1,509 kilograms (3,505.3 lb) and 1,680 kilograms (3,703.8 lb), respectively. Also, the weight distribution has moved more rearward than before, being split 40.6:59.4 (Coupé) and 40.4:59.6 (Spyder). Audi has also adjusted the chassis and suspension to accommodate for the lighter curbweight. Less mass means Audi can fit stiffer suspension without ruining the ride or comfort levels. 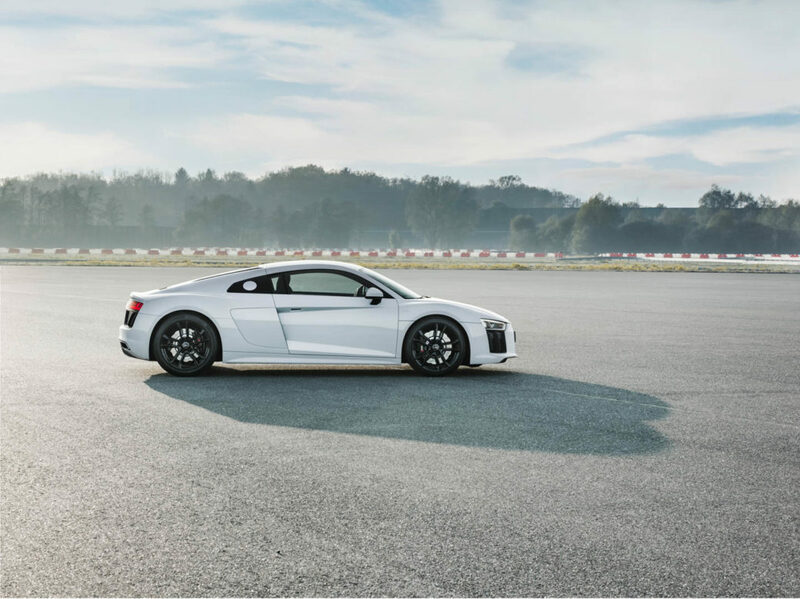 Audi has even slacked off the electronic stability and traction control to allow the R8 V10 RWS to kick its tail out more willingly in Dynamic mode, with ESC (Electronic Stability Control) set to Sport. But the best part of all is that the front wheels are now completely uncorrupted. No longer is the steering bothered by the forces of driven wheels, allowing it to be more precise, have better feedback and much less torque steer. It should also have less understeer and the Audi R8 V10 RWS should handle far more beautifully and be far more balanced than the standard car. It also gets some unique design touches, as well, to distinguish it from its Quattro-bearing sibling. A matte-black Singleframe grille and air inlets adorn both the front and rear ends of the car, to give it a sportier, more aggressive look. The sideblades are also split in color, with the upper half being gloss black and the bottom half being body color. There’s also a new five-spoke wheel design, featured on black-finished 19″ wheels, wrapped in 245/35 section tires up front and 295/35s at the rear. There will also be an optional red film running over the hood, roof and rear end. Inside, the Audi R8 V10 RWS gets basically the same cabin as the standard R8, just with an as-standard leather and Alcantara combo. There’s also a cool little “1 of 999” emblem on the dash, to represent which numbered car it is out of the 999 units being made. Orders will start in Autumn of 2017 in Europe, with no word on any US-bound models, and deliveries will start in early 2018. Cost for the R8 RWS will be 140,000 Euros for the Coupe and 153,000 Euros for the Spyder. We’re not entirely sure if a rear-wheel drive Audi will ever work in practice of if it’s just wrong. However, it sort of feels right and the Audi R8 is the perfect car to do so with. Not only is it the easiest car to do so with, as it’s the only Audi to be rear-wheel drive-based to begin with, but because its personality really works with rear-wheel drive. This Audi R8 V10 RWS is a mid-engined, rear-wheel drive supercar with a naturally-aspirated V10 engine and 540 hp. What car enthusiast wouldn’t sign up for that? What was your favorite car from the 2017 Frankfurt Motor Show?